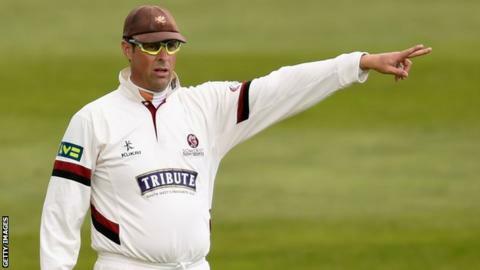 Former England opener Marcus Trescothick has signed a new one-year contract with Somerset. The 39-year-old is joined by Max Waller, Jack Leach and Josh Davey in agreeing new deals at Taunton. Somerset's captain retired from international cricket in 2008 due to a stress-related illness, having been part of the 2005 Ashes-winning side. "Marcus is the absolute model professional," said Somerset director of cricket Matt Maynard. "He has contributed a tremendous amount to this club. "Whilst he is coming to the twilight of his career on the field his experience and knowledge are second to none and he still has a very important role to play both on and off the field." Trescothick played 76 Tests, 123 one-day internationals and three Twenty20 matches for England, his last appearance a 50-over game against Pakistan at The Oval in August 2006. Spinners Waller and Leach and seam bowler Davey have all signed new two-year contract with the county. "Max has been with the County for a long time now and knows exactly what it means to be a Somerset player. He is a strong presence in the dressing room and is one of the top English bowlers in T20 cricket," Maynard said. "I have been really impressed with Jack Leach. He has a great attitude and is a very talented cricketer. If it wasn't for his injury he would have had a really big season for us and I expect him to be a top performer in 2016 and beyond. "This year has been a big one for Josh Davey. He performed very well in the World Cup and also made his First XI debut for us. I am looking forward to seeing what 2016 has in store for him. "All four players have really bought in to what we are trying to achieve and I am delighted that they have all signed these new contracts."